So far my revival of Superheroes, etc. hasn't been much of a revival. I've been focusing most of my online efforts over at Comic Book Galaxy's group blog, Trouble with Comics and most of my posts here have just been cross-posts with TWC. That will change soon. I'm working on a series of reviews focusing on comics with rebirth or return themes (e.g. Daredevil: Born Again, Swamp Thing, Vol. 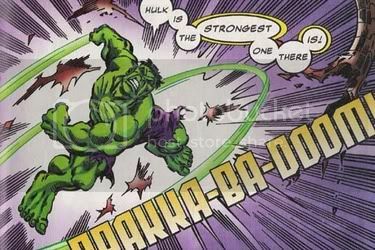 6: Reunion) as well as what I hope to be a weekly Hulk appreciation column, every Friday called "HULK IS THE STRONGEST ONE THERE IS!" But realistically I don't think I'll be ready to kick things back into high gear for a couple of weeks - the week of Oct. 19th at the earliest. Until then, I've got a weekly column over at TWC called "Extra Medium" (the second installment was posted today). I can't recommend the blog strongly enough. Reading TWC is one of the best parts of my day, regardless of whose pieces are up. All the guys over there are gifted, insightful writers and I feel privileged to be a part of the blog. So, if you've stumbled upon this site, please come back soon. I'll have more for you shortly. And in the meantime, feel free to check out the sidebar at reviews I've posted here and elsewhere.